Cross-infection to client from using another client's slide sheet. Ensure client handling is done with flat open hands (not grasping with opposing thumb and fingers). Ensure client's bed is at a height to safely complete this task, avoid excessive leaning or stretching. Set bed height at the wrist of the tallest worker performing the task. One worker on each side of the bed, unless otherwise indicated in client's support plan. 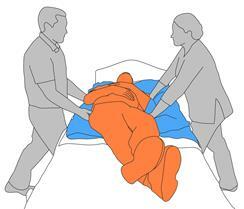 Refer to SWI for Rolling and Repositioning a Person on how to safely position a client onto their side. Workers position hands, using pushing/pulling motion to gently roll client onto their side. Position slide sheet behind client. First worker places scrolled/folded slide sheet along the back of client, making sure the "open ends" of the sheet face the client. Roll client onto back and retrieve sheet. Second worker to slide hand in under client and catch the rolled end of slide sheet at thigh or neck. Second worker pulls the slide sheet through, unrolling and spreading out the sheet. First worker keeps client steady. Position client's legs and take starting stance. Angle and cross client's legs over, placing the leg on top which is nearest the side being moved towards (refer image). Both workers are to stand level between client's shoulders and hips, and adopt a short stride stance. Second worker to grip top sheet only, grasping near the client's hips and shoulders. Counting in, second worker rocks back onto leg further away from bed, creating movement of the client on the top sheet. The first worker adds a pushing action at the trunk and hips. Remember to maintain good posture without leaning or twisting, and for movement, use your body, not shoulders. Second worker to maintain same grip as in Step 5, on top half of slide sheet and reverse direction to pushing. This will enable client to roll onto opposite side. Do not use shoulders to lift. First worker to stay in place, make sure movement is slow and steady for client. Ensure client is in a stable side position. With movement complete, most of slide sheet will face first worker, with both halves now open. Second worker to retrieve bottom half of slide sheet by gently removing from under client, pulling corner diagonally away from the client and toward the head of the bed. Task for moving a client from side-to-side is now complete.